In a recent Forbes Magazine, they published and revealed the results E-Poll Market Research survey that showed the most disliked figures in all of sports. Finishing in the top spot was no other than Philadelphia Eagles backup quarterback Michael Vick, who earned a 69 percent dislikability rating. "Michael Vick has been out of prison for almost a year," Tom Van Riper wrote. "He's publicly apologized for his role in a dog-fighting ring that landed him behind bars for 21 months. He's got an uncontroversial year on the football field behind him as a part-timer for the Philadelphia Eagles, who have picked up his option for another season." For Vick, this is the second year in a row that he has received the top honor of most hated athlete on the planet. However, Forbes believes that Vick could be on his way back into the fan's good graces. 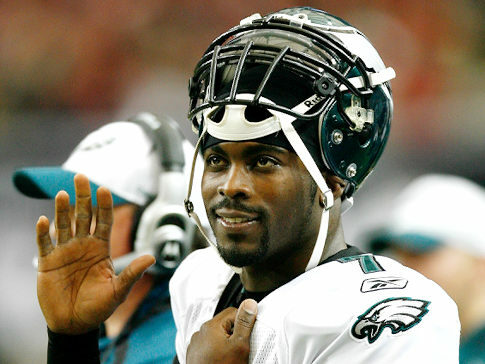 "The ASPCA turned down Vick's offer to work with them on animal cruelty prevention. Nonetheless, Vick still appears poised for a recovery with the public," Riper wrote. "Unlike some athletes whose main talent seems to be getting in trouble, Vick was a popular and dynamic player before the dog-fighting episode--all he must do is repent for the single episode that sent his stock dropping like lead." The rest of the top five included Raiders owner Al Davis [second], Steelers quarterback Ben Roethlisberger [third], golfer Tiger Woods [fourth], and Cowboys owner Jerry Jones [fifth]. Besides Vick, there were two other former Philadelphia athletes that cracked the top ten. Disgruntled and free agent wide receiver Terrell Owens finished at No. 7 on the list and Philly favorite Allen Iverson was ninth. The poll surveyed 1,110 people from around the country that were 13 years or older. In addition, the participants had to be currently active in sports as a coach, manager, broadcaster, agent, owner or player. Even though Judge says that Vick was a bit of a reach to make this list, his dedication this off-season and his performance on the practice field has vaulted him into the category of a top five backup quarterback. "Granted, this might be a reach. I haven't seen a whole lot of Michael Vick in the past three years, either, with the former Pro Bowl quarterback on call as a stand-in last season," Judge Wrote. "He didn't play much, and he didn't do much when he did play, so I'm not really sure what we have here, and the Eagles might not, either. Nevertheless, Vick is still young (he just turned 30), and when I watched one of the team's spring workouts, he seemed to have his speed and quickness back. All I know is that he's not someone I'd want to face off the bench." Certainly, Vick is not setting the world on fire with his passing skills, but his game-changing ability, quickness and knack for making the impossible provable is what really impresses Judge. "He's not an accurate passer, and he's not all that smooth as a quarterback, but he is ... or was ... a playmaker, capable of disrupting games with his helter-skelter, anything-goes play. He will make things happen, and he might, just might, wear out your defense while doing it," he wrote. "I concede that Vick is more of a playmaker than a bona fide quarterback, but he's capable of breaking open a game and breaking down an opponent with a single run, play or pass. Yes, he's wildly unpredictable, and normally that's not good. But in Vick's case, it can make him difficult to defend." Certainly fans of other teams and even some Eagles fans will never forgive the once heralded quarterback for his sins, but if he can continue to impress people like Judge and harness his skills, he could become a star starting quarterback again. Last Thursday, the Philadelphia Eagles announced that they had cut undrafted rookie cornerback Devin Ross. Ross was considered to be a sleeper UDFA and had a decent shot at making the club as the team's fifth corner and kick-off returner. Unfortunately, Ross never established himself as a cornerback in OTAs because he had to fill the void at safety since Kurt Coleman was finishing up his education at Ohio State. Currently the Eagles are still over the required roster limit heading into training camp, which is set by the NFL at 80. Also, the roster does not include Brandon Graham, Nate Allen or Riley Cooper. This means that at least four players are going to be cut within the next couple of weeks. Over the weekend, the New Orleans Saints agreed to trade offensive tackle Jammal Brown to the Washington Redskins for a third or fourth-round pick in the 2011 NFL Draft depending on certain scenarios. If the Redskins make the playoffs, win nine games or Donovan McNabb reaches the Pro Bowl then the Saints would only receive a fourth-round pick since the Eagles would acquire the Redskins’ third-rounder as part of the stipulations of the McNabb trade. If none of those situations occur, then the Eagles would acquire the fourth-rounder and the Saints would receive the third. Still, the draft picks might not be the most significant part of the trade. The Redskins headed into the off-season with one of the weakest offensive lines in the league. Chris Samuels decided to retire and the rest of the line was in shambles. Now new Redskins head coach Mike Shanahan has drastically improved the offensive line with the additions of Brown and the selection of Trent Williams at No. 4 overall in the 2010 NFL Draft. Brown, 29, missed the entire 2009 season, but if he can return to his two-time Pro Bowl form [2006 and 2008] then the Redskins would have their bookend tackles for the next couple of years [assuming they resign him...playing on the last year of his contract like McNabb]. Additionally, the Redskins can now ease Williams into the left tackle spot since Brown has played and been a good left tackle his whole NFL career. Furthermore, the acquisition of Brown allows McNabb to have time in the pocket, which he will desperately need as he will face Trent Cole, DeMarcus Ware and Justin Tuck on six different occasions this year. More importantly, the acquisition might have added years onto McNabb's career. Before obtaining Brown and Williams, McNabb looked as if he was going to take a pounding behind a porous offensive line. Now, it looks like he could make it through the entire 16-game schedule. Like always, this trade just makes the NFC East just a little more interesting and a little more competitive. Eagles One of Six Playoff Teams From '09 To Miss 2010 Playoffs? According to Mike Forio of The Sporting News, the Philadelphia Eagles will not make their third consecutive trip to the postseason. Forio acknowledges that recent history has shown that only half of the teams that made it to the playoffs in the previous season make it back to postseason play. While the city of Philadelphia believes strongly in their new starting quarterback Kevin Kolb, Forio feels Kolb will face too much criticism and pressure to succeed. "When the Eagles made Kevin Kolb their first draft pick (at the top of round two) in 2007, they laid the foundation for April's decision to dump long-time starter Donovan McNabb," he wrote. "And while Philly has plenty of faith in Kolb, he'll soon be facing more scrutiny than he ever could have dreamed." Another reason Forio sees the Eagles struggling to earn a playoff berth is due to having too many question marks along the offensive line and the defense as a whole. "The offensive line has plenty of question marks, and the defense regressed significantly in the first year of the Sean McDermott era. To succeed, the Eagles need to clamp down on opposing offenses and display patience when in possession of the ball," Forio wrote. Lastly, Forio says that playing in the NFC East division has a large say in their demise as well. "It won't be easy, especially in a division that includes the Cowboys, the Giants, and McNabb," he wrote. The Super Bowl Champion New Orleans Saints, the Cincinnati Bengals, Arizona Cardinals, New England Patriots and New York Jets accompany the Eagles. Without a doubt, the Eagles will experience a lot of growing pains this upcoming season with the amount of young players playing significant minutes. Additionally, the odds are not in their favor to make it back to the playoffs, but this is usually when Andy Reid has his teams soaring. The Eagles seem to play their best football when the so-called “experts” count them out of it. Moreover, it is hard to believe that both the Saints and Jets will miss the playoffs. It could be argued that the two squads are more likely to be facing each other in the Super Bowl since their rosters are oozing with talent.